The colors are a tad more frosted than I would like, but after blending together the shimmer does settle down into a wearable look for the office. The "instructional placement" concept is nice but I prefer to use the colors as I darn well please - and never would I use a shimmer shade on my brow bone - the horror! I prefer to use the lighter shades on my lid and work the dark shades through my crease or as a liner. Caveat emptor however, these are quite delicate shadows and ones that I am sure would not travel well. Just a dab into the palette with my brush and powder goes everywhere so I can only imagine what my bathroom floor would look like if one were to slip from my fingers - what a mess. But then again at this price, I could afford a few back ups so maybe I will throw caution a little more to the wind with these. What is life without taking risks????? 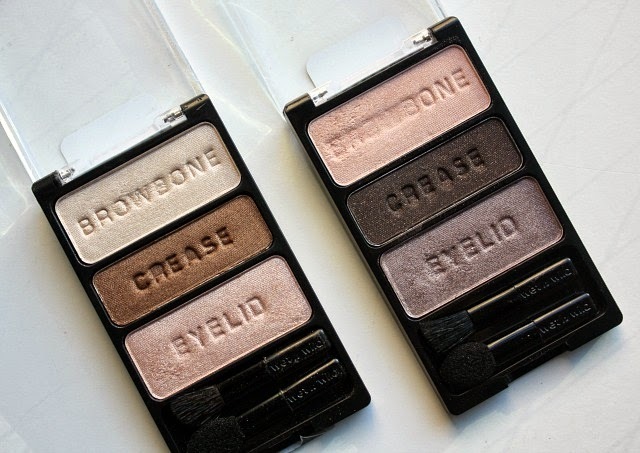 I'm pretty sure I have these two and a few more, plus a couple of the bigger palettes. I don't use them nearly as often as I should. They were quite surprising to me and I find myself reaching for them more and more!